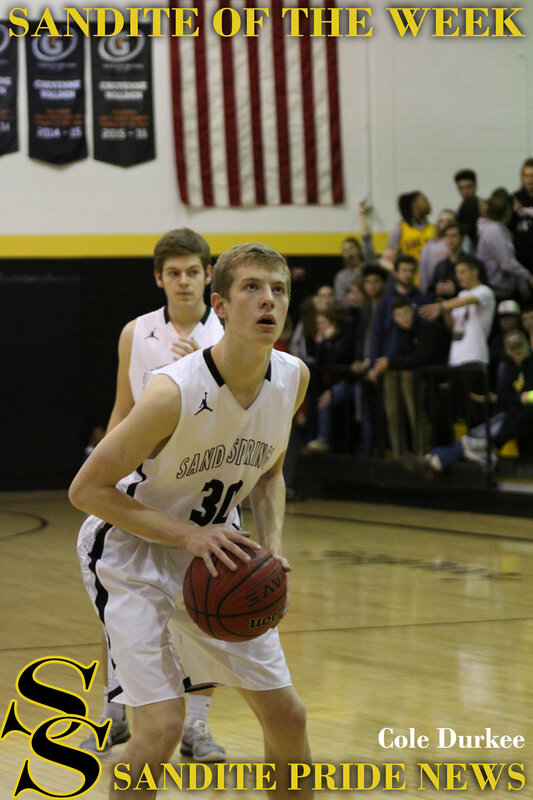 6'3" Charles Page High School junior Cole Durkee was selected as our Sandite of the Week for his consistent performance over four games this past week, likely the best week of his career. The Class 6A No. 8 ranked Sandites (7-1) suffered their first loss of the season on Tuesday at the hands of No. 3 Union (4-2) but snapped back with an undefeated performance at the Tulsa Memorial Veterans' Arena Invitational. They defeated Wichita 85-50, Northwest Arkansas 82-57, and Redemption Life World Institute 72-64. Durkee scored ten points against Union, then added a career-high fifteen points to lead his team in the win against Wichita, going three-for-three from three-point range and collecting six rebounds along the way. He followed it up with another career-high the following night, scoring sixteen against Northwest Arkansas and was only two points behind team-leader Colt Savage. Against Redemption he scored thirteen points for his fifth-straight double digit game. Over the course of the four games he recorded 54 points, six offensive rebounds, twelve defensive rebounds, four assists, four steals, and two blocks. He was 55% on field goals, 45% from three point range, and 50% on free throws. The Sandites will return to action Wednesday, December 27th at 5:30 p.m. against U.S. Grant (1-3) in the first round of the Duncan Holiday Classic.